The prime central London property market is made up of just two boroughs; the Royal Borough of Kensington & Chelsea and the City of Westminster. But within this area of less than ten square miles prices and long-term growth can vary hugely within what we call ‘micro-markets’. Paddington in W2 is one such micro-market and the fortune of this part of Westminster is changing rapidly while the fortunes of its near neighbours stagnate. Europe’s biggest infrastructure project will soon be completed with the first passengers boarding the Elizabeth Line in late 2018. The Elizabeth Line will stretch for more than 60 miles, linking Heathrow in the west to Abbey Wood in the east. The Elizabeth line will serve 41 stations including 10 new stations at Paddington, Bond Street, Tottenham Court Road, Farringdon, Liverpool Street, Whitechapel, Canary Wharf, Custom House, Woolwich and Abbey Wood. It’s estimated that the Elizabeth Line will bring an extra 1.5 million people to within 45 minutes of Central London. With increased connectivity and brand new stations come new opportunities for business and residents alike. In 2012, a study commissioned by Crossrail stated that by 2021 residential house prices around new stations were predicted to rise 25% more than the average price rise in central London, and 20% higher than rises in the suburbs. Of course many have already jumped onto the Crossrail bandwagon and seen significant rises in property values near new stations over the past years. But we believe it’s not too late to get in on the action. Although property values have faltered in W2 recently, dropping by 5.1% last year (source Lonres), we believe a surge in people moving into the area once the line is open presents a fantastic opportunity for buy to let investors. After all, who can resist shiny new stations and fast trains? Once the full benefits of the Elizabeth Line start to be realised, expect a surge in interest in the local market. 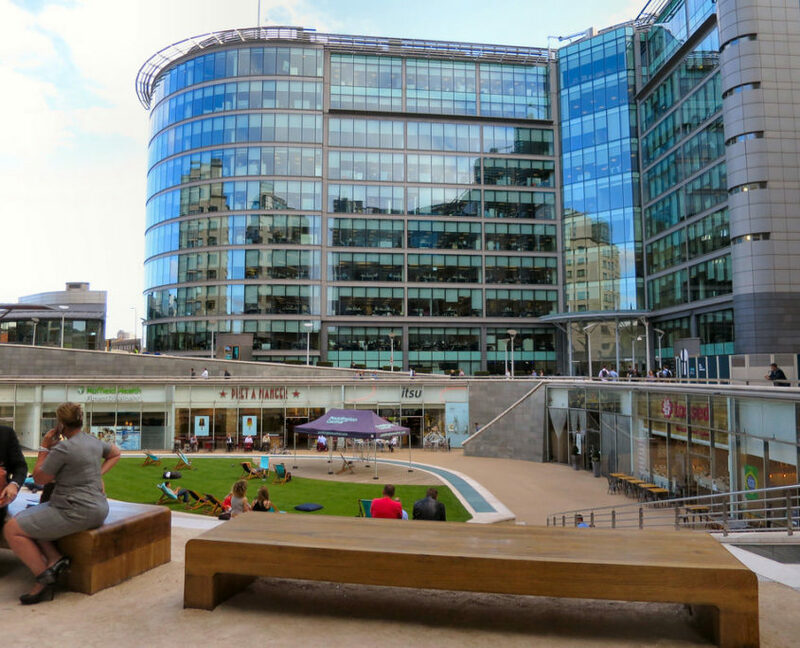 A long-term programme of regeneration has seen Paddington move from being a slightly seedy transport hub to a modern, classy district in its own right. It all started back in 1998 when the Paddington Partnership was set up to drive the redevelopment of the unloved area around the station. 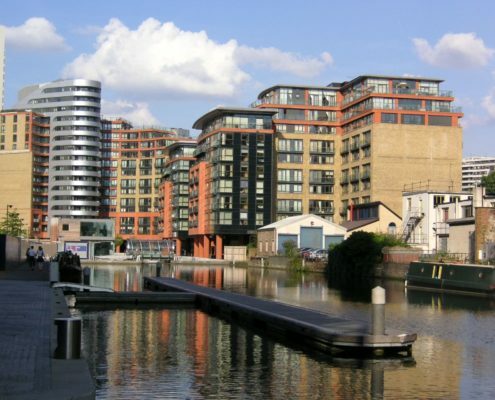 This led to the creation of Paddington Central, an 11-acre development alongside the disused canals of Paddington Basin. 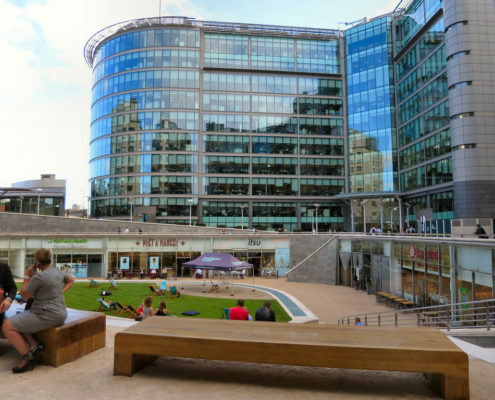 Paddington Central is now home to an array of glass office blocks and company HQs, fancy new apartments and retail spaces all overlooking the calm waters of the canal. 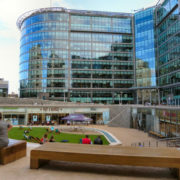 Sheldon Square, the heart of Paddington Central is host to a regular programme of cultural events such as outdoor cinema as well as street food pop-ups and markets. The whole area really comes to life in the summer as office workers mingle with residents in the bars and restaurants. The next major redevelopment, subject to planning permission is Sellar Property Group’s £775 million ‘Paddington Quarter’ project. Sellar have teamed up with Renzo Piano, the architect famous for the Shard and Great Western Developments to overhaul Royal Mail’s sorting office next to Paddington Station. At the heart of the new development will be ‘Paddington Cube’, an ultra modern 14-storey development that promises to accommodate 4,000 new jobs in the area. Part of the project aims to dramatically improve access to Paddington Station, along with a £65m new Bakerloo line station and ticket hall, which can only improve the appeal of the area. You know an area has changed its fortunes when the hipsters start to arrive. For decades the area around Paddington Station has been defined by old-fashioned cafes, slightly scruffy hotels and chain eateries mopping up the tourists who had stepped off the Heathrow Express. Another hip new opening is the Lockhouse bar and restaurant on Merchant Square. One of a small chain of exclusive gourmet burger restaurants, they also specialise in London craft beers. So why did they choose Paddington? Co-owner Mark Draper explains in a recent interview ‘The amount of new development taking place in Paddington is monumental, and the area is destined to become a new, vibrant central London hub. It’s great to be part of this evolution from the start and to create a brand that has the same ambitions for long-term growth. With so much change for the positive, there is only one trajectory for the Paddington area in coming years – upwards. If you’d like advice on where to buy in London in 2018 or just want to chat about property, don’t hesitate to contact one of our team of experts.